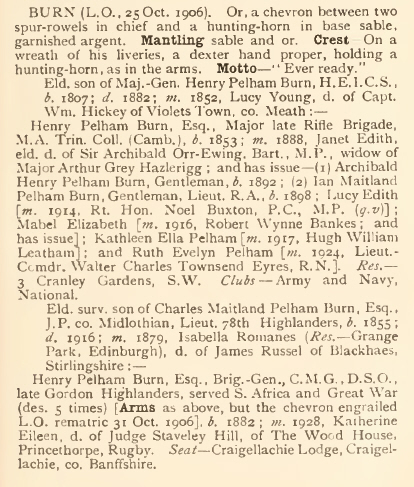 The 1906 Grant of Arms from the Lyon Court to Major Henry Pelham Burn is on sale at eBay with a “Buy it Now” price of £1,500. The Grant is listed in the Lyon Register as 19/9, 25th October 1906. Arms: Or a chevron between two spur revels in chief and a hunting horn in base Sable garnished Argent. 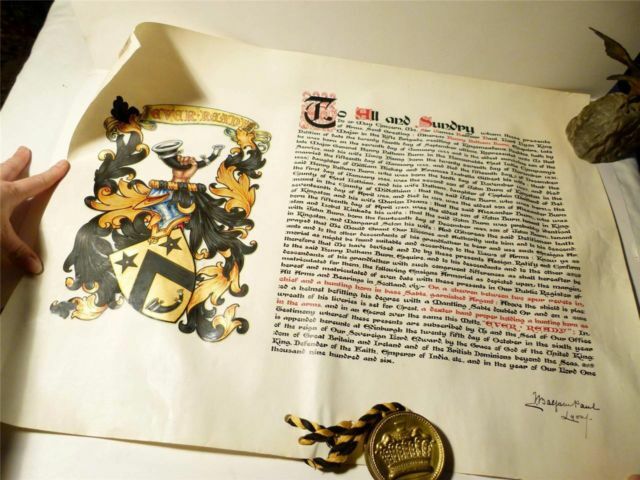 Crest: A dexter hand proper holding a hunting horn as in the Arms. From the excellent set of photographs supplied by the vendor, diggerlee, it seems that Major Burn had the Grant made to an ancestor – I cannot make out the actual relationship. Also included within the sale is a bookplate of Charles Maitland Burn who bears the same Arms but with the chevron engrailed and impaled with the Arms of Russel. They are listed in the Lyon Register as 19/10, 31st October 1906.